The American Business Council of Dubai & the Northern Emirates and Akin Gump Strauss Hauer & Feld LLP hosted a discussion in Dubai, on the impact of regional sanctions relief on UAE companies. 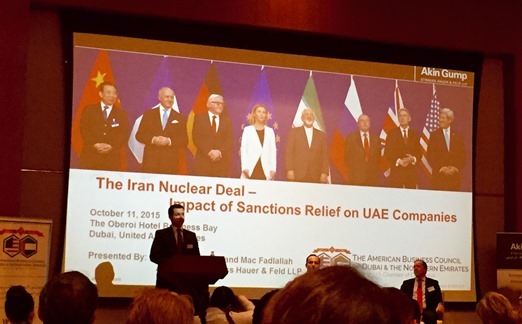 The panel of experts, included former U.S. government officials, from Akin Gump’s Abu Dhabi, Dubai and Washington, D.C. offices, who examined the intricacies of how the easing of sanctions resulting from the recent nuclear deal impacts companies operating in the Middle East, including U.S. multinationals in the UAE. UTS was represented by Rafiq Al Gailani, Vice President - Strategic Projects & Principal Relations, and Mr. Rashid Ishaq, Regional Business Development Manager - EPC.